1. Can you expect 100% protection against MDV field challenge in vaccinated birds? No. As with all other vaccines, achieving 100% protection under field conditions is not possible from a biological viewpoint. In chicken flocks with healthy immune system and that are properly vaccinated and raised under adequate management, the losses are low without a significant impact on livability and/or performance. In cases of severe field challenge at an early age in vaccinated layers and breeders, mortality around 2-5% and broiler condemnations due to MD at ~0.05 % have been observed. 2. Which vaccine or vaccine combination may offer the best protection against field challenge in broilers, broiler breeders, or commercial layers? Broilers are vaccinated with HVT or HVT+SB1. HVT+SB1 is used in locations where very virulent (vv)MDVs are prevalent and the HVT vaccine alone does not provide an optimal protection. In some cases, particularly in heavy birds (e.g. roosters), HVT+SB1 may not provide adequate protection due to the prevalence of vv+MDV. In these circumstances, the bivalent HVT+CVI988(Rispens) or the trivalent HVT+SB1+CVI988(Rispens) vaccine has been used. Using below recommended dose of plaque forming units (PFU) is a common practice in broiler vaccination, however, it should be noted that this practice can lead to MD breaks in the face of severe field challenge and may play a role in accelerating MD virus evolution towards greater virulence. 3. When to make a change in vaccination strategy to increase the level of protection in breeders from HVT, to HVT+SB1, or HVT+ CVI988(Rispens), or HVT+SB1+ CVI988(Rispens)? Breeders should be preferably vaccinated with the bivalent vaccine HVT+CVI988(Rispens) (see Q2). In cases of poor protection against MD in breeders that are vaccinated only with HVT or HVT+SB1, a change in the vaccination that includes HVT +CVI988(Rispens) or HVT+SB1+CVI988(Rispens) should be considered. 4. Why condemnations alone are not a good parameter to evaluate protection against MDV field challenge? Condemnations alone in young birds are not a good parameter for the evaluation of protection against MD because several other diseases (e.g., respiratory problems, infectious bursal disease and septicemia) can cause an increase in condemnations. In properly vaccinated flocks, MD condemnations are consistently lower than condemnations due to other causes. In evaluating the protection against MD in broilers, one should include the percentage of “leukosis” condemnation due to MDV (lymphomas in different organs, skin and leg lesions). In addition to tumors, MDV is also able to induce non-neoplastic syndromes including neurological syndromes, eye lesions, immunosuppression, and arteriosclerosis. Some of these non-neoplastic lesions especially immunosuppression could contribute to other non-tumor causes of condemnation. The incidence of tumors in broiler chickens contributes to the condemnation rate. However, the condemnation rates do not provide any direct information about the incidence of non-neoplastic aspects of MDV disease. While it is considered that vaccination protects against most of the non-neoplastic syndromes, little is known about how it protects against immunosuppression-induced by MDV. Due to the above reasons, condemnations alone are not a good parameter to evaluate protection against MDV field challenge. 5. How can immunosuppression caused by MDV be present without an increase in tumor-like lesions? MDV can induce immunosuppression by different mechanisms, some of which are not fully understood. Immunosuppression induced by MDV can start much earlier than the onset of tumors. Much of the impact of MD, particularly in broilers, is the immunosuppression induced in non-protected birds. The effect will be an increase in secondary infections (e.g., airsacculitis by E.coli), poor antibody responses or poor protection conferred by other vaccinations (e.g., IBV vaccination). It has been recently demonstrated that reduced weight gain can be detected in birds partially protected against a challenge with a very virulent (vv) MDV before an increase in tumor incidence is apparent. However, immunosuppression caused by MDV needs further investigation and it is difficult to assess under field conditions since it is not always associated with lymphoid organ atrophy. 6. What are the benefits of a double vaccination strategy for breeders? Double vaccination can enhance protection under field and experimental conditions. Various double vaccination programs have been used: a) in ovo vaccination followed by revaccination at the hatchery, b) one-day-old vaccination at the hatchery followed by revaccination a couple of hours later or at the farm at delivery. There are also examples where vaccination at one day of age has been followed up with a revaccination several days to up to 2-3 weeks later on the farm. Recent studies have demonstrated that the benefit of double vaccination requires the use of a higher protective vaccine as the second vaccine. In addition, a schedule consisting of in ovo vaccination followed by revaccination at the hatchery is the most beneficial double vaccination strategy not only because of better protection but also due to logistics. In this schedule, all vaccines would be administered at the hatcheries, whereby all the vaccines are administered before the chickens are in contact with the wild type virus. In other schedules, the second vaccine has to be administered at the farm, most likely after the chickens have already been exposed to the wild type virus. In addition, under field conditions there is always the possibility that a small percentage of chickens will be missed or do not receive the full dose at a single vaccination. Revaccination would minimize chickens missed at the first vaccination, as it is unlikely that this would happen twice to the same chick. 7. Can MDV be present in mixed infections with other viruses (REV, ALV)? Yes, chickens infected with MDV or vaccinated for MD can also be infected with avian leukosis virus (ALV) and/or reticuloendotheliosis virus (REV). MDV infection is ubiquitous and it is expected that most, if not all chickens are infected under field conditions. It might also be possible to have MDV-induced tumors in chickens that are concurrently infected with retroviruses. 8. What to do if a MD vaccine failure is suspected? In case of a MD vaccine failure, the first action is to carry out a MD vaccination audit at the hatchery. Several vaccine manufacturers as well the in ovo equipment suppliers carry out these audits involving vaccine storage, handling, mixing and administration procedures. Measure vaccine DNA load in the feather pulp of vaccinated chickens to determine if vaccines replicated in the chickens. This would confirm if the vaccine was administered properly and if the vaccines replicated in the chickens. Monitoring early challenge with field viruses. Since it may take 5-7 days to achieve full protection after in ovo or s/c vaccination at one day of age, an early challenge will result in vaccine failures. Rule out other immunosuppressive etiologies such as Chicken Anemia Virus (CAV), Infectious Bursal Disease Virus (IBDV), Reovirus, Subgroup J infections, mycotoxins, and stress. Pathotyping of the prevalent field strains. A particular vaccination might not provide an adequate protection against highly virulent MDV (e.g., HVT in case of vvMDV). 9. Can I use feather pulp to measure protection conferred by vaccination? Measure degree of challenge? Differentiate between MDV serotypes? 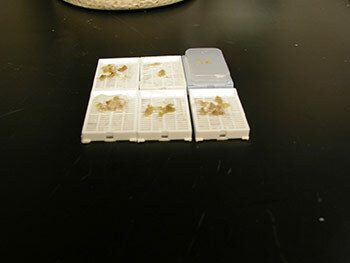 Feather pulp samples can be used for an early diagnosis of Marek’s disease. Chickens that are developing tumors have higher load of MDV DNA in the feather pulp and in peripheral blood than in chickens that are not developing tumors. Measuring MDV DNA load in feather pulp at 3-4 weeks can provide an indirect evidence of how chickens are protected against MD. The real-time (quantitative) Polymerase Chain Reaction (qPCR) will enable differentiation between MDV serotypes (e.g. Serotype 1 (pathogenic and CVI988(Rispens)) vs. MDV vaccine strains of serotype 2 (e.g., SB1) and type 3 (HVT). Differentiation between pathotypes however is not possible by molecular techniques. Biological assays involving challenging vaccinated chickens with corresponding MDVs are required to determine the pathotype of a particular MDV. Feather pulp samples can be stored frozen at -70C until processed or may be collected in FTA® cards (treated filter paper that preserves DNA/RNA but destroys the protein, hence inactivates pathogens) (see question 24 for further details). If the samples are sent from abroad appropriate importation permits (from APHIS) are required. 10. Where to get Marek’s vaccines for back yard flocks? Which products are available and how to administer those vaccines? MD vaccines can be bought from the different poultry vaccine manufacturers. The vaccine of choice would be the bivalent HVT+CVI988(Rispens) which will provide the broadest spectrum of efficacy. The MD vaccines are in cell-associated form, which means that the vaccine virus is present in live cells and in order to maintain its infectivity, the cells have to be kept viable. The vaccine has to be transported and stored, frozen at -196ºC in liquid nitrogen in special containers. Before use, the vaccine has to be mixed in specific diluents provided by the vaccine manufacturers and must be applied in 1-2 hours by subcutaneous vaccination in the neck region of the chick in the hatchery. The minimum dose size of the commercial available MD vaccines is 1000 doses/ampoule. This might be a problem if only a small numbers of birds have to be vaccinated. After the vaccine is mixed in the diluents, it has to be used immediately and cannot be stored. It is strongly recommended to follow the instructions of transport, storage, mixing of vaccine in diluent before use, and actual vaccination as prescribed by the vaccine manufacturer. Vaccines made available by several Internet Web suppliers are mostly in freeze-dried (lyophilized) form and contain only HVT. The freeze-dried vaccine, which needs to be stored at 2 - 7ºC until reconstitution in the diluent, will provide a minimum level of protection, but this may be enough for very small isolated backyard flocks. The vaccine cannot be stored after reconstitution and needs to be used within 2 hours. 11. Does Marek’s disease vaccine protect against the infection? No. MD vaccination does not protect against further MDV infection but does help to reduce the development of tumors. Detection of a pathogenic MDV in a vaccinated healthy chicken flock is of no direct diagnostic relevance. It indicates that the vaccinated flock has been infected and is shedding pathogenic MDV. 12. What is the diagnostic relevance of detecting an oncogenic Marek’s disease virus in a chicken? None. Detecting an oncogenic MDV in a vaccinated flock does not have any diagnostic relevance. Every chicken in the field is exposed to oncogenic Marek’s disease virus which ubiquitous in the poultry industry. Marek’s disease vaccines protect against the development of tumors but not against the infection with oncogenic viruses. Oncogenic MDV can be found in chickens that will never develop MD because they are properly protected. 13. What are the repercussions of mixing other vaccines with MD vaccines? Mixing other poultry vaccines with MD vaccines to be simultaneously applied in ovo or at one day of age can interfere with the MD vaccination. One can only safely mix those vaccines and doses recommended by the vaccine manufacturer. Mixing vaccines contrary to the manufacturers recommendations is considered “off label” and may cause poor response to MD vaccination. 14. What are the repercussions of mixing antibiotics and MD vaccines? Officially no antibiotics are approved or licensed to be mixed and used with MD vaccines. However, “off label” antibiotics are occasionally used in the diluents with MD vaccines, particularly in broilers. The most commonly used antibiotics added to MD vaccination are gentamycin and ceftiofur. Used at the therapeutic dose no deleterious effect on the MDV has been shown. Increasing the therapeutic dose has shown an effect on the MD vaccine titer due to a change in pH or osmolarity of the diluent. In the US and several other countries these antibiotics can be administrated by veterinary prescription only. In several instances, a dye is added to the diluent to monitor successful vaccination procedure and the specific type of dye and the concentration recommended by the vaccine manufacturer should be used. Antibiotics and dye have to be mixed with the diluent before the MD vaccine is added. 15. Can you use an HVT-based recombinant vaccine along with a regular HVT vaccine? No. One cannot simultaneously vaccinate HVT recombinant vaccine with a conventional HVT vaccine nor use a conventional HVT vaccine in ovo followed by the HVT recombinant at one day of age or the other way around. The HVT vaccine will interfere with the HVT recombinant causing a poor efficacy against the foreign insert (e.g. NDV, IBDV) in the HVT recombinant. No effect on the MD protection has been observed. 16. What is the minimum dose (maximum dilution) of MD vaccine that can protect against MD? In the context of this fact sheet it is difficult to provide the minimum dose of commercial vaccines providing complete protection. These data should be obtained from the particular vaccine manufacturer. The actual virus concentration is expressed in plaque forming units (PFU) per dose. In general, one plaque equals one virus-infected cell (e.g., in case of a HVT vaccine with a titer of 5000 PFU per dose, the vaccine contains approximately 5000 HVT virus-infected cells/dose). As a general guideline HVT titer per dose should be approximately 2000 PFU, SB1 and CVI988 (Rispens) 1000 PFU each. Each vaccine manufacturer must determine their own vaccine release titer and they differ among the manufacturers. The poultry industry requires high PFU titers for long lasting birds like breeders and layers and at minimum titers of 5000 PFU/dose for HVT and 3000 PFU/dose for SB1 or CVI988 (Rispens). Administration of less than recommended doses of MD vaccines is a common practice in the US broiler industry and usually the vaccines require minimum titers of 4000PFU/dose HVT and 3000 PFU/dose SB1. Administering less than recommended vaccine doses can lead to reduced protection in high virulent MD field situations (see question 5). 17. Can I use live cell counts of MD vaccines for vaccine titration? No. Counting live cells gives an indirect idea on how the vaccine has been handled during transport, dilution, vaccination, etc. If vaccines have been poorly handled, the number of live cells will be low and the vaccine titers will be also low. Most of today’s MD vaccines are cell-associated frozen vaccines produced on cell cultures, the harvested infected live cells are kept in specific stabilizers filled in ampoules and stored frozen at -196ºC in liquid nitrogen. Remember that due to the cell-associated nature of MD vaccines and the virus dies if the cell dies. It is crucial to keep the cells viable to maintain the infectivity titer. A very low viable cell count may indicate a low virus titer. However, if the number of live cells is high, it does not necessarily mean that the vaccine titers are high since not every cell may be infected with the vaccine virus. The only way to know the titer of a vaccine is by titration in cell culture (plaque assay) and the virus titer is expressed in the number of plaque forming units (pfu)/dose. 18. Is it safe to eat a chicken infected with tumor viruses? Yes. In spite of numerous epidemiological studies, MDVs and avian leukosis viruses have not been shown to be a public health concern. Neither MDV nor ALV can infect humans or induce any disease in humans. There is absolutely no public health concern. 19. 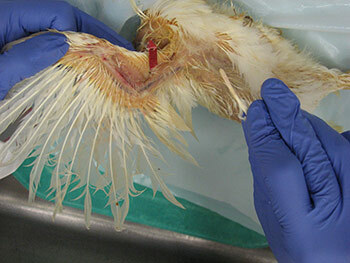 What is the normal incidence of gross tumors in commercial poultry? It all depends on the etiology of the tumors. Most breeders are free of exogenous retroviruses and therefore the incidence of tumors due to exogenous retrovirus should be zero. However, it has been reported that specific pathogen free chickens that are free of exogenous retroviruses and MDV may develop spontaneous lymphomas. The incidence would be extremely low and the economical losses associated with them are minimal, if any. However, under field conditions, it is important to determine the etiology of those tumors to rule out that chickens are indeed negative for exogenous retroviruses. MDV is ubiquitous and vaccines do not protect 100% of the chickens. It is considered that efficacy of MD vaccines is 95-97% under experimental conditions. Vaccine efficacy might be reduced under field conditions, when the challenge with MDV occurs very early in age (before vaccine immunity if fully established) and other immunosuppressive diseases might coexist. Therefore, it will be normal to have some chickens develop MD and have tumors. However, increased incidence of MDV-induced tumors would require re-evaluation of the vaccination protocols and procedures, biosecurity measures, control of other immunosuppressive diseases, and/or existence of more virulent MDV pathotypes. 20. Which tissues should be submitted for histopathology when suspected of tumors? Tumor samples with the adjacent normal tissue, various nerve plexi (sciatic, brachial, and vagus nerves), bursa of Fabricius if still present, and any other tissue with suspected lesions should be submitted. 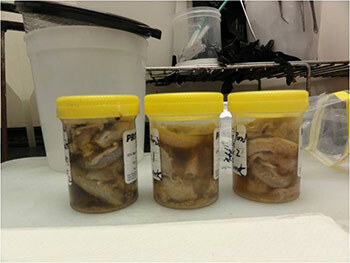 Samples should be collected from birds that are freshly euthanized or have been dead for not more than 24 hours. For further details see page 11 in Tumor Diagnosis Manual. Importation of formalin fixed samples into USA must be done following regulations and with the proper importation permits. Please contact the diagnostic lab in advance to obtain the required APHIS permit that has to accompany the samples. 21. How should I fix tissues for histopathology? 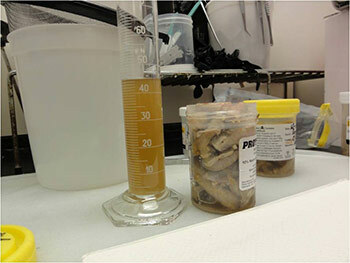 All samples need to be placed in 10% neutral buffered formalin as quickly as possible. Also there should be a 10:1 ratio of formalin to tissue to ensure complete fixation. Figures 1 and 2 show an incorrect way to submit samples. Do not submit samples from birds dead longer than 24 hours. 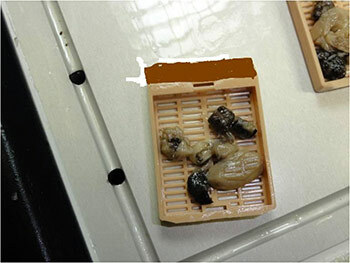 If samples are submitted in cassettes, do not overfill the cassette with tissue. Please note the cassette marks on the tissue in Figure 3 that will result in artifacts hindering microscopic interpretation. 22. How should I ship formalin fixed samples? Samples should be shipped in leak proof containers as formalin is considered a hazardous liquid. Otherwise, after fixing for 24 hours, pour off most of the formalin and seal the container to prevent leakage and to keep tissue from drying out. Shipping fixed samples in “whirlpak” bags by air mail results in the samples becoming compressed and distorted (such as eyeballs) due to the lack of air pressure in the cargo area. Blocks can be sent but be aware that temperatures in the summer time might melt paraffin wax as illustrated in figure 4. Information regarding the samples should be included on the container as well as on the submission form of the laboratory. Signalment and vaccination status for MD must be included. If a submission form is not available, provide a complete history of the affected flock including age, type of bird (broiler, Broiler breeder, layer etc), clinical signs, gross lesions etc. The phrase “Tissue for Histo” is not a history or reason for submission. That infers what test you want performed. 23. How can real time PCR help in the diagnosis of Marek’s disease? Why conventional PCR cannot be used for the diagnosis of Marek’s disease? MDV is ubiquitous and every chicken (healthy and sick) might be infected with oncogenic viruses. If MDV infection is latent, chickens are healthy (albeit infected). If MDV infection progresses to neoplasia, then the infected chickens develop MD. Any technique that allows only detecting the presence of an oncogenic MDV, such as virus isolation, conventional PCR, antigen detection, sequencing of oncogene meq…. etc, does not have any diagnostic value due to ubiquitous presence of this virus in the field. It indicates that chickens have been infected with an oncogenic MDV but does not say anything regarding the disease status. Real time PCR permits the quantification of the MDV DNA load. It has been demonstrated that MDV-induced tumors have many more copies of MDV DNA than latently infected tissues. Real time PCR therefore allows differentiation between tumors induced by MDV and tissues that are only latently infected with MDV. 24. What specimens are recommended for submission of samples for PCR and/or real time PCR? The ideal sample to submit for the diagnosis of MD by real time PCR is either frozen tumors or tumor imprints collected on FTA cards. Frozen feather tips, refrigerated blood (using EDTA as anticoagulant), or imprints of feather pulp or blood collected on FTA cards are also acceptable. Samples from each chicken should be kept independent. Do not pool samples from different chickens because that could give false negative results. Growing feathers from the alar track are the best source for feather pulp samples (Figure 5A). 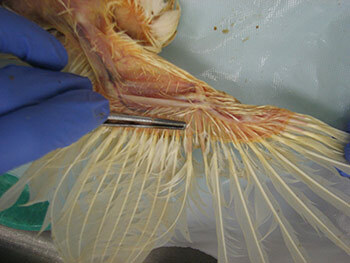 Feathers with fleshy feather pulp should be plucked out (Figure 5B) and the feather pulp can be squeezed using a sterile plastic tip onto a clean surface (Figure 5C). 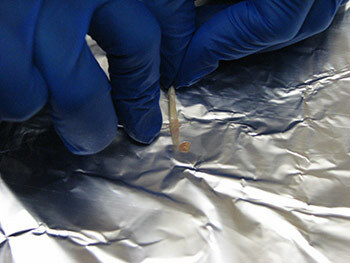 The same tip can be used to place and spread the feather pulp sample on the FTA card (Figure 5D). Imprints of tissues and blood can also be collected on FTA cards. If several tissues are collected into the same circle, samples should not be mixing with each other. That could give false negative results. Importation of samples collected on FTA cards into USA must be done following state and federal regulations and with the proper importation permits. Please contact the diagnostic lab in advance to obtain the required APHIS permit that is required to accompany the samples. 25. How Virus Isolation helps for the differential diagnosis of tumor diseases? Virus isolation aids in the detection of exogenous retrovirus and reticuloendotheliosis. Most genetic lines are free of exogenous retrovirus, and therefore they should not be detected in commercial flocks. However, isolation of oncogenic MDV does not have any diagnostic value. 26. What specimens are recommended for submission of samples for Virus Isolation? MDV can be isolated from live buffy coats, splenocytes, and tumor cells. It is best to submit live chickens to the diagnostic lab. Otherwise refrigerated blood (using heparin as anticoagulant), splenocytes, or tumor cells maintained in refrigeration for 1-2 hours could be submitted. Various materials can be used to detect infectious retroviruses, viral antigen, or antibody. 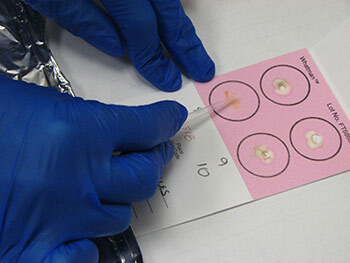 Samples of whole blood or plasma are most commonly used for virus isolation; cloacal or vaginal swabs or egg albumin can also be used. Materials used for biological assays for infectious retroviruses should be collected and placed on melting ice or stored at -70 C until assayed. Samples for detection of ALV group-specific antigen (p27 gsa) are usually collected in the buffer that is used in a particular test and stored at -20 C. For example, samples to be tested by the enzyme-linked immunosorbent assay (ELISA) are collected in phosphate-buffered saline (PBS) containing 0.1% Tween 80. Most USA laboratories are not allowed to receive samples for virus isolation from foreign countries. Contact the proper OIE reference lab for further information in this regard. 27. What does a diagnosis (detection) of ALV subgroup E means? Can subgroup E cause tumors? Slow vs. Fast Feathering lines and detection of subgroup E by PCR? Endogenous ALVs are transmitted genetically and are termed subgroup E ALVs; they are present as either complete or defective genomes in almost all normal chickens. To date, there is no concrete evidence that endogenous ALVs can cause tumors; however, they are known to increase susceptibility of chickens to exogenous ALV infection and tumors. Slow-feathering lines harbor an endogenous virus termed EV21 that is closely linked to the slow feathering gene. Diagnosis of infectious endogenous ALVs can be diagnosed by inoculating CEFs that are susceptible and resistant to subgroup E ALVs. 28. Why are broiler breeders and commercial layers not free of subgroup E viruses? Most broiler breeders and commercial layers are not free from endogenous virus or endogenous viral genes because they occur in somatic and germ line cells and are transmitted genetically in a Mendelian fashion to their progeny by both sexes. Freedom of endogenous viruses can be achieved by genetic selection. However, this procedure has not been utilized because it may have a negative effect on economically important traits. 29. What is the difference between endogenous and exogenous virus? Endogenous virus or endogenous viral genes occur in somatic and germ line cells of most chickens and are transmitted genetically, whereas, exogenous ALVs are infectious viruses that transmit vertically (dam to progeny), or horizontally from chicken to chicken. Endogenous viruses belong to subgroup E ALV and exogenous viruses in chickens consist of 5 subgroups, A, B, C, D, and J. 30. Can tumors be diagnosed without a positive diagnosis for a tumor virus? Most tumors in poultry are induced by viruses but not all of them. Therefore, it is possible to find a tumor in the absence of any virus (i.e. squamous cell carcinoma, ovarian adenocarcinoma….). Sporadic lymphomas not associated with any viral infection have being described also in specific pathogen free chickens. There are two groups of viruses that can produce tumors: herpesviruses (Marek’s disease) and retroviruses (avian leukosis virus group, reticuloendotheliosis, and lymphoproliferative disease of turkeys). MDV will always be present in an MDV-induced tumor. However, MDV will also be present in latently infected tissues that don’t have any tumor. Detection of MDV by itself does not have any diagnostic value. Quantification of MDV DNA load in the tumor is needed to confirm MDV as the etiology of a tumor. Because ALV is ubiquitous, virus isolation and the demonstration of antigen or antibody have limited or no value in diagnosing field cases of tumors. However, testing for virus, antigen, or antibody is instrumental in programs for reducing or eradicating ALV infection in breeder flocks. Pathognomonic gross and microscopic lesions of ALV-induced tumors may be present in the absence of demonstration of virus or antibody. Immunohistochemistry and molecular assays are usually used for identification of the phenotype of tumor cells. 31. How to determine the main cause of a tumor problem? Epidemiological and clinical data: Retrovirus-induced tumors take longer to develop than MDV-induced tumors. Therefore, tumors in chickens under 14 weeks of age are most likely induced by MDV. However, tumors in older chickens could be induced by both MDV and retroviruses. Retroviruses do not induce tumors in the nerves, so if besides of visceral tumors there are enlarged peripheral nerves, the diagnosis is most likely MD. However, if there are no nerve lesions both MDV and retroviruses could be the cause of tumors. Retroviruses induce intrafollicular transformation in the bursa and MDV induces interfollicular transformation of the bursa. If bursal lesions are present it is possible to confirm a diagnosis by histopathology. However, bursal lesions might not be always present. Presence of lymphoproliferative lesions in peripheral nerves can confirm a diagnosis of MD. MD tumors are composed of a heterogeneous population of cells while retrovirus-induced tumors are composed of a homogeneous population of cells. Cells features however are difficult to appreciate if samples have not been fixed properly or if sample is autolytic. Lesions in the brain and in the eye are only indicative of MDV infection but not of MD. MDV-induced tumors have higher load of MDV DNA than MDV latently infected tissues. MDV-induced tumors are composed of T cells and retrovirus induced lymphomas are composed of B cells. Immunohistochemistry markers to detect cell phenotype aid in the diagnosis. Detection of MDV oncogene meq by immunohistochemistry in a tumor confirms the diagnosis of MD. 32. Which laboratories are recommended for the diagnosis of tumor virus diseases? USDA-ARS, Avian Disease and Oncology Laboratory is considered the National Reference Laboratory for Avian Tumor Viruses. It is also Serves as the World Organization for Animal Health (OIE) Reference Laboratory for Marek’s disease. OIE reference laboratories can assist in the diagnosis of tumor diseases, provide advice, training, and reagents to standardize diagnostic techniques in other laboratories. Certain reagents such as but not limited to monoclonal and polyclonal antibodies, reference viruses and antigens, and cell lines are available at USDA-ARS, Avian Disease and Oncology Laboratory in East Lansing, Michigan (http://www.ars.usda.gov/mwa/lansing/adol). Usually a Material Transfer Agreement (MTA) between USDA-ARS and the requesting institute is required. PCR primer sets for detection of REV and various subgroups of ALVs have been published. PCR primer sequence can be obtained from USDA-ARS, Avian Disease and Oncology Laboratory, East Lansing, Michigan (http://www.ars.usda.gov/mwa/lansing/adol). Besides of the OIE laboratories, in the USA there are several laboratories at universities and diagnostic labs specialized in tumor virus diseases that can assist in the diagnosis and provide advice. 33. How to diagnose REV? Is REV a primary or secondary agent in cases with tumor lesions? A number of in vitro and in vivo assays can be used for detection of reticuloendotheliosis virus (REV) in suspected cases. Under certain field conditions such as vaccination with contaminated live virus vaccine, or exposure at very early age, REV can be a primary cause of tumors. The presence of REV is confirmed by the demonstration of viral antigen or provirus in chicken embryo fibroblasts (CEFs) or in specific-pathogen-free chickens inoculated with the suspected sample. Using REV polyclonal or monoclonal antibodies, CEFs inoculated with the suspected sample can be examined for REV by immunofluorescence. Detection of REV proviral DNA by polymerase chain reaction (PCR) assays that amplifies the 291 base pairs product of REV LTR can be used for detection of various strains REV in CEFs and in blood of SPF chickens inoculated with suspected samples. Detection of antibodies against REV indicates prior exposure to the virus but it is insufficient to confirm a tumor diagnosis. 34. Can histopathology alone give a final diagnosis for the cause a tumor problem? Difference between presumptive vs. final diagnosis? Histopathology is the first tool available to characterize a tumor and aids in the diagnosis. Histopathology is the best way to determine which types of cells are in the tumor, extension of the lesions, and malignancy. However, histopathology has many limitations to determine the etiology of the problem. Based on the location of the lesions and the features of the cells, it is sometimes possible to provide a tentative diagnosis such as lymphoid leukosis, myeloid leukosis, or Marek’s diseases. However, lymphoid leukosis lesions can result as a consequence avian leukosis virus, reticuloendotheliosis virus, or even spontaneously. There is no way to differentiate between those etiologies by histopathology. Also, differentiation between Marek’s disease and lymphoid leukosis by histopathology might not be possible in all cases. 35. Can I use immunohistochemistry for differential diagnosis of lymphoid tumors? If so, can formalin fixed tissues be used? Reticuloendotheliosis can produce both types of tumors and further tests should be conducted if REV is suspected. Antibodies to detect cell phenotypes in chickens do not work very well in formalin fixed samples. Samples need to be snap frozen in liquid nitrogen. See Q36 to see how samples should be snap frozen. Most USA laboratories are not allowed to receive frozen tissue samples coming from foreign countries. Contact the proper OIE reference lab for further information in this regard. Immunohistochemistry can be very useful also to detect the MDV oncogene meq. Expression of meq is very high in MDV-induced tumors and this assay is very specific to confirm MD. However, there is no commercial source for antibodies against meq. In addition, meq is a nuclear antigen and the immunohistochemical stain requires the use of tyramide signal amplification to achieve appropriate results. 36. How can I freeze samples for immunohistochemistry? Figure 6 shows the steps to freeze samples for immunohistochemistry. Fresh samples should be collected in freezing mounting medium OCT (Tissue Tek, Sakura Finetek, Torrance, USA) (Figure 6A-C). A drop of OCT medium will be placed in a mould (Figure 6B), then the tissue will be placed on the drop of OCT medium (Figure 6C), and the mould should be filled with OCT medium making sure there are no bubbles (Figure 6C). The mould with the sample and the OCT medium will be exposed to liquid nitrogen vapors (Figure 6D) until the OCT becomes hard and opaque white (Figure 6E). The block is then ready to be stored at -70C. Before cutting the sample in the cryotome it is advisable to place the frozen block at -20C for an hour. 37. Can I use FTA cards for collecting and submitting samples (feather pulp, tumors) for tumor diagnosis? Yes, tumor samples or feather pulp can be collected to confirm diagnosis of MD by real time PCR. Samples collected on FTA cards can also be used to detect by PCR the presence/absence of retroviruses when using specific primers that do not detect endogenous retrovirus. See Q24 for how to collect tissues in FTA cards.